Especially unusual new situations trigger a natural escape behavior and hypersensitivity in horses. Stress can also have a negative effect on the concentration of horses. Because it is impossible to avoid all stress situations Relax has been developed. Relax AC contains the Arglasol® complex - a mixture of Mongolian artemsia (mugwort, thujone-free), lemon balm, St. John's wort, hop and magnesium. 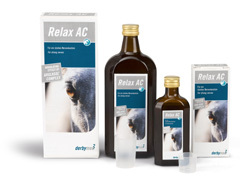 This composition ensures that Relax AC can be used to reduce the physiological stress response short- and long-term. For optimal results the horse should be quiet and calm at the time of administration up till the time of expected onset of action (1 - 2 hours after administration). The desired calming effect will last for 4 - 5 hours. tendency to nervousness of the horse.